Over the past couple of years, I’ve noticed that there are two words — as well as variations of these words — that get me more excited than almost any other. Those are “procedurally generated”, as well as its cousin, “randomly generated”. I mean, I’ve always loved randomness in games because replayability is a big factor in my enjoyment of a game, but lately this one factor has been even more important than ever. I started thinking of this topic because recently a game I had NO interest in called Don’t Starve shot to the top of my interest meter once I read “Randomly Generated New Worlds” in the list of the game’s features. I don’t even LIKE survival games that much, but randomly generated worlds? Sign me the hell up. This made me begin to wonder both why I love procedural generation so much, and how it figures into the realm of space gaming. I think the first game in which I really took notice of random generation was either the original X-Com or perhaps Civilization II (never got around to playing the first one). Before those games, I’d mostly been mired in flight simulations (wherein this random thingy didn’t really come into its own until dynamic campaigns came around) and space adventure games, which could be damned open but were mostly built on static maps with linear plots. I don’t even think I realized that the missions in Wing Commander: Privateer were randomly generated into some time during my second playthrough wherein I realized, “Hey, these missions from the mission computer aren’t the same as last time.” I then fell in love with that game just a little bit more. ;) I mean, in games like Privateer and the like, I love missions. LOVE. THEM. I mean sure one can make money trading, and I do a fair bit of that too, but missions are where it’s at as far as I’m concerned. Gimme a place to go and a thing to do and I’m a happy space pilot. Now give me an unlimited amount of things to do and places to go and I’m even happier! In space gaming, we seem to get more games that lean toward the linear side of things, which is fair. Building a large universe in which to fly around at will or rule an empire is likely a much tougher proposition than building a smaller, more linear set of missions with their own set pieces and self-contained acres of space. Thankfully, this trend seems to be changing, albeit slower than I’d like. One of the biggest donations I made to Kickstarter was for the Limit Theory campaign, as it all looks wonderfully procedurally generated (I mean, it says so right in the title of the Kickstarter!). We also spoke to the developer of Rodina for our most recent podcast (which should be out soon), a procedurally generated space combat game that will be coming out in alpha form, which I am damned excited to try. What is it about random generation, however, that gets me all hot and bothered? I think, besides the replayability factor is also the unpredictable nature of procedural generation. I mean, there are a lot of linear spacey games I love to play repeatedly (TIE Fighter being a recent example), but with linear games, I feel like I have to wait a while after finishing a playthrough to play it again so I can forget stuff and try to regain that rush of excitement at seeing something that’s seemingly new. Randomly generated games, however, don’t really have that problem (unless you play them soooooo much that even the variations get predictable, but I reckon that would take a while). I think the success of random generation is most apparently in strategy games. I mean, over a decade later, people are still playing the first two Master of Orion games, Master of Magic, the Kohan games and so on because they feature (among their other exceptional gameplay assets) fantastic random map generation. This is also one of the reasons I love Distant Worlds so dang much, because of the amazingly busy and vibrant random galaxies that game can generate. We’re seeing this even more in non-space gaming, as roguelikes have really been taking off (hurr) of late. I know I’ve just been playing a glut of fun roguelike games, and with the success of FTL, I’m hoping we’ll see even more games like this lifting off for the stars. Thankfully, it also appears as if we’ll be seeing more procedurally generated spacey fun times in the months to come. 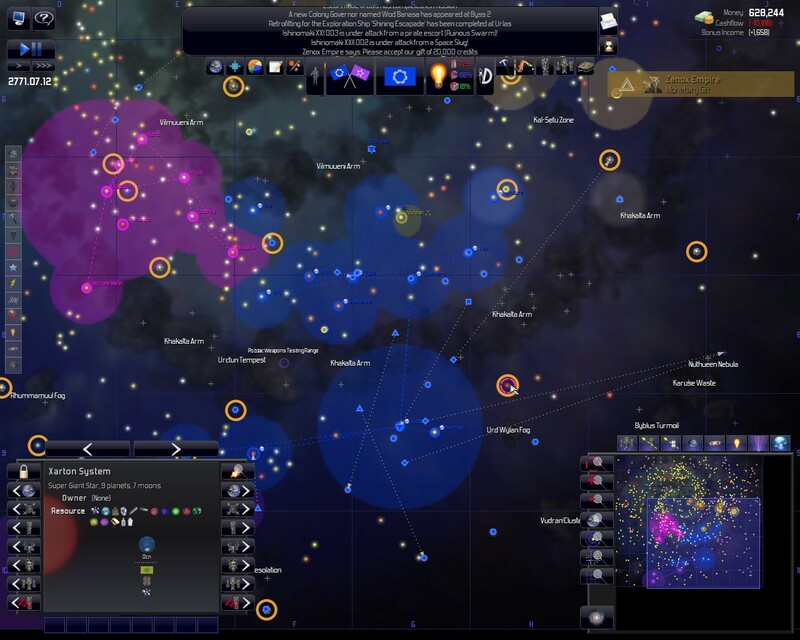 Besides Limit Theory and Rodina, other games such as Rogue System, Infinite Space 3 and even more will have randomly generated universes and/or campaigns, promising to keep us space game nuts busy for a long time to come. I’ve said this before, but I truly think we’re in a second golden age of PC gaming, with indies leading the way. Thankfully many indies are embracing the awesomeness of procedural generation, giving their games a longer lifespan and, to me, a better chance of actually buying the game. This coupled with exceptional gaming tools such as Unity and others are allowing independent game developers to take us to worlds we would have never been able to visit otherwise, and I for one couldn’t be happier. We must share a gaming gene, because I totally agree. Procedurally generated worlds make for much better sandboxes… and I like playing in a convincing sandbox. The other side of that coin, for me, is games like Star Command (iOS). I funded the Kickstarter and read all the updates… and I lost almost all interest in the game as soon as they revealed it would have a linear story (not to mention that panic is a core challenge of their gameplay… bleh). I’ve tried to love EVE so many times. Each time, I end up just mining and mining and mining and getting too bored to log in, or I join a corp and it goes to war and I end up being blasted repeatedly and losing all my hard work. I want to love EVE… but I dislike the steepness of the grind and death penalty. Same here. I probably never would have decided to just ‘make my own damn game’ if it wasn’t for EvE War Decs. I’d spend months — Months recruiting miners. (Because they were just more pleasant to be around). Then we get a random War Dec and in less than 24 hours 3/4 of the roster jumps ship. Happened way too many times. And I can’t blame them. They wanted to ‘play’ a game. And whether anyone wants to admit it or not, EvE Online, at it’s very core, is a Combat game. As weird as it sounds, I believe players simply want to “live” in a game and play an actual role in it’s universe that doesn’t require them to tread on someone elses need for fun. Oh yeah, I TOTALLY wanna live in the game universe and make my way. I don’t mind piracy and stuff if it’s done organically. That’s part of the fun. In EVE, it’s anything but organic. I have exactly the same “problem” with EVE Online. I like just to live in universe, travel and explore. I “forced” myself to buy and sell stuff on market to make my travel more meaningful. :-) For me construction is more fun. We need more construction sandbox space games! How about dynamically generated? In VOD there is randomness, but the randomness is based on events, and the current state of things in the universe. For example, another race who isn’t at war with another race won’t attack their space stations. Or you won’t be ambushed by an alien nation hostile to you, on the other side of the universe away from their territory. Events will make sense and take place according to where you are, or who you might have pissed off. Btw a new DW expansion being released while trying to develop a game isn’t easy. Stop tempting me! I think we’re all the same feaky people who don’t buy those AAA games made up around a rail-like scenario and want random sandboxes all around ! I fit in the genre also and the games I play are generally sandboxes with a great part of controlled randomness. But there is a trend towards sandboxes, and, interestingly enough, many online semi-casual games use at least parts of sandbox in their design, to offer a lot of replayability and make people stay in the long run. So I think sandboxness and randomness is an expanding feature in the world of games today, if not overtly, but little by little and in a slow but powerful way. As for me… I’m building a space game named “Stars of Call” as a TC of an open-source very simple but powerful framework named “NAEV”, from the game of same name, that some here may know. That need for sandbox gaming and freedom in a vast universe was what drove me into that adventure ! And it’s quite exciting to build part after part a fully sandbox game. One has to study what could happen and never let a path unexplored, or it may backfire into your hands… or open new, unforeseen scenaristic avenues ^-^ In my opinion, the best recipe for a compellng and immersive game is a solid, consistent background, on which to build a sandbox where many small things are randomized and then left to interact and create truly livelike events ! And it happens to be just what people here like ^-^ Life is nice, no ? Random generation is awesome. Hope to see even more of it. Age of Wonders Shadow Magic has brilliant random maps and at least IMHO is superior to Age of Wonders III though the next expansion does look VERY promising. Of course there is the wonderful Approaching Infinity which has become digital crack. But there is another game I wanted to mention that you might like. The game is titled Hand of Fate and just came out of BETA into full release on Steam. I don’t think I could the game justice by trying to write a description at 5:21 AM. Check it out on Steam Brian. I think you just might like the core mechanic. I do own Hand of Fate, it’s really fantastic. And of course since I am writing so late, I should have written “I don’t think I could do the game justice …” Argggh!! I loathe sleep when there are so many games to play!